We ship Australia wide daily, orders received by 2pm are usually sent out on the same business day. Orders received after 2pm are usually sent out on the next business day. Please be advised that the BMC Luna APAP (auto)/CPAP (fixed pressure) machines are not discontinued as other online retailers claim. The BMC Luna APAP (auto)/CPAP (fixed pressure) machines are in fact the most advanced GII (Generation II) CPAP Machines released by BMC. All BMC Machines come with a 5 year warranty + Add any BMC mask to your order for $50 + All BMC Masks and accessories come with a 90 Day Warranty. The BMC LUNA LUX G2 APAP is the most advanced CPAP in the BMC range. The BMC Luna APAP their Top-of-the-Range/flagship model automatic CPAP(Continuous Positive Airway Pressure) Machine, Adjusting automatically to deliver the necessary pressure through the night. The Luna APAP machines offers the latest sensory technology to automatically adjust pressure throughout the night to keep your airway open while you sleep, thus preventing any collapse. Typically CPAP machines begin with a low initial pressure, and slowly increase to the pressure prescribed by your doctor. The BMC Luna Auto machine creates optimal comfort with a ramp time of up to 60 minutes, compared to most CPAP machine's ramp time of 20 minutes, making it a cost effective and comfortable way to treat Sleep Apnea. To optimize therapy comfort, Luna also uses RESlex Exhalation relief. This technology delivers different pressure based on your natural breathing cycle, creating comfort and ease during exhalation. Using humidification with your CPAP machine will reduce common symptoms like dryness of the throat and congestion. The Eco Smart humidifier comes free with all Luna machines and adds heat and moisture to the air delivered by the system, improving overall comfort. The humidifier can also be removed when travelling to reduce size and weight, making your Luna Machine the ideal travel companion. Large 3.5 inch color LCD display screen. 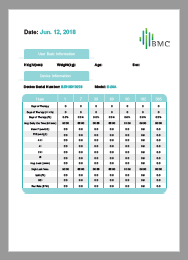 The BMC offers a range of options for sharing results with the Physician or CPAP Provider. iCode by phone. The patient can read a code on the CPAP screen which when entered into the desktop or icode connect web portal gives accurate compliance data for the Physician or CPAP provider. Photograph the iCode QR+ on the CPAP screen using the BMCares app. Search for BMCares app on Android or Apple App store. Click the picture below for example report that can be emailed to you, and two other contacts. IE your Physician or CPAP Provider.